Just when you thought the Terminator franchise was dead, along comes a mobile game developer to prove you wrong. Hitting mobile platforms today is Terminator Genisys: Future War, a new clan-based multiplayer game from Plarium Games. Why the developer wanted to hitch its wagon to the least-successful sequel in the series is beyond us, but setting Future War in the post-Skynet timeline where humans battle machines was definitely a smart choice. Taking place after the events of Terminator Genisys, Future War will let players choose to side with John Connor and the Resistance or Skynet and the unstoppable killing machines it creates. As with so many clan-based mobile games, Future War will have you making a base, collecting resources, recruiting soldiers, and upgrading all those elements to fend off opposing players. There will be alliances to make, other players to squash, and the future of humanity at stake. Probably. Using a phone as a tactical battle device seems like exactly the thing Skynet wants us to do before it goes active and takes over the world. Unfortunately, the trailer for Future War doesn’t show much of what the actual game will play like. Instead, it’s a rendered short hinting at the possibilities for battle. Things won’t play out quite as nicely as they do in the footage above, but you get an idea of what Plarium is going for with the tone and style. There are glimpses at the different types of classes each side of the conflict will have at their disposal, including Hunter Killers, T-800s, snipers, heavy troopers, and more. 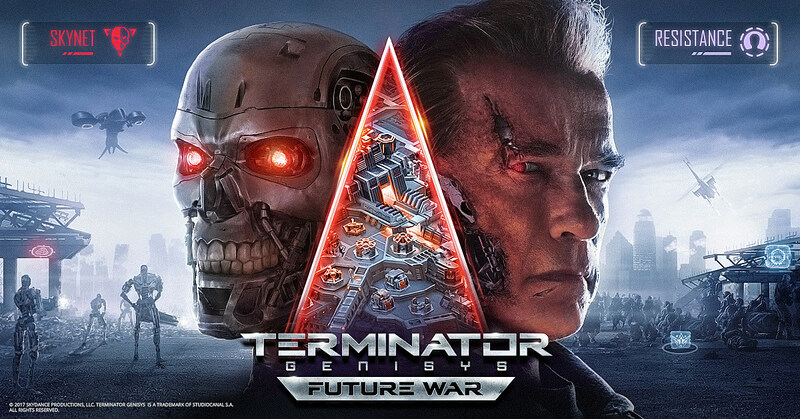 Curiously, Arnold Schwarzenegger is included in some of the promotional materials, though he’s not anywhere to be seen or heard in the trailer. Arnold is no stranger to the mobile game space, appearing in commercials and advertisements for Mobile Strike. It’ll be interesting to see if his contract allows him to appear in more than game art for Future War. Bringing that kind of star power to the fold in as an actual playable character or class could do wonders to help Terminator Genisys: Future War stand out from the dozens upon dozens of other similar games already available on various app stores.